This may be the best audio book I’ll ever hear. If there aren’t plans for it to become a movie, it’s just a matter of time. Someone alert Steven Spielberg or Martin Scorsese. The quality of an audio book can be determined by the reader. Within minutes you understand why this reader, Stefan Rudnicki, has won Grammys. Yet, even though the quality of the production is fantastic, the mesmerizing aspect of this book is the life story it covers. 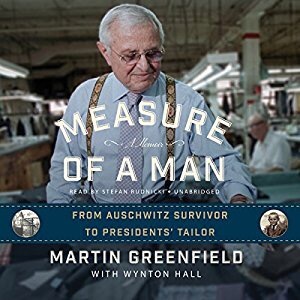 Mr. Greenfield’s story includes the horror of the holocaust, his transitioning to America, his providential start in the tailoring business, and his fortuitous connections to politicians and celebrities. Despite his success, he maintains the importance of loyalty to his family, his faith, and his workers. He gives all the credit to God for how his life illustrates the measure of a man. …are inspired by other’s success. …believe God deserves all the credit.